Programs can occupy a lot of storage on your PC’s hard drive. You may have programs installed on your PC that fit that category, programs that you may not have run in a while. If so, feel free to remove those huge hogs from the primary storage device. Here, you see the list of installed programs on a PC, as sorted by file size. Yes, all of them are games. And, if you no longer play a game, you can uninstall the program and free up gigabytes of storage space. Large programs, sorted by size. Choose the top item from the search results: Programs and Features Control panel. Click the Size column heading to sort the list of programs by their size. You may have to click the column heading twice so that the list is presented from largest to smallest. 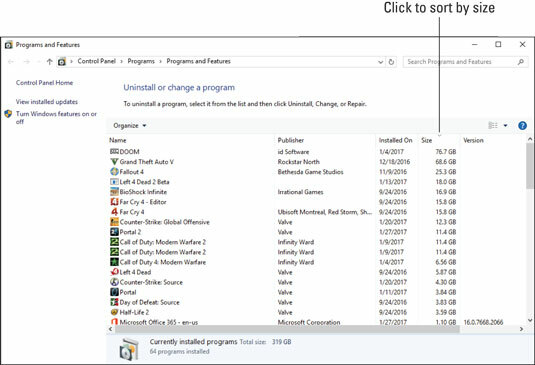 To uninstall a program you no longer use, click to select the program and then click the Uninstall button that appears. Continue following the onscreen directions.